Adobe has a winner of an upgrade in InDesign CS6. The combination of improvements to its digital publishing tools, PDF forms authoring, language support, and dozens of workflow refinements make this an upgrade that will surely pay for itself. The most visible improvements center, not surprisingly, around digital publishing—specifically converting content for one medium or device to another. Adobe has clearly listened to user requests and updated its aging document model to make it more useful for today’s workflows. One of the biggest engineering hurdles was how to intelligently link content from one document to another, so that if you made changes in one place, they would update in other places. In CS6, Adobe smartly extended the familiar “placed” content model, wherein graphics not native to a layout are linked to original content, and where users must manually update those linked items when the originals change. In CS6, you can link from one object in an InDesign layout to other objects in different layouts within the same document. You can define one frame as a Parent frame, and then link to it from Child frames in other layouts. The program remembers graphics, text, and formatting. If the Parent content changes, the Child items indicate that change with a warning badge for that link. You can then choose to update the link and its content. To accommodate this new functionality, Adobe had to change the document structure. Now, similar to the approach Quark pioneered years ago in QuarkXPress, one document may contain multiple layouts, and each layout can link some of its content to the others. Layouts are conceptually similar to sections in previous versions of InDesign, but show up under new tabs in the Pages panel. To assist users in generating new layouts based on an existing layout, Adobe added the Alternate Layout feature, which creates a duplicate of your original layout, optionally with a new page size and orientation. When exporting your project for a .folio file for Adobe’s Digital Publishing Suite—for publishing to devices like the iPad—both the horizontal and vertical layouts are automatically included. InDesign CS6's Liquid Layout feature assists users in repurposing layouts for different devices. And, since every project is different, Adobe included multiple ways to reformat pages. Sometimes, all you need is a simple Scale technique for resizing everything on the page in the same way. Other times, you don’t want to scale page objects, but rather re-center them on the newly sized page. However, designers will want even more control than that, which InDesign CS6 provides by way of object-based layout adjustments. If you choose the object-based Liquid Layout approach or rule, each object you hover your mouse over will display little handles that you can use to pin it to one or more edges of the page. Then, when you resize the page, the object stays the same distance from the edge of the new page as the original. All the other objects on the page will float into new positions as the page is resized. Adobe helpfully lets you pin the object by either clicking the pins attached to the object, or by clicking checkboxes in the new Liquid Layout panel. When working with complicated layouts, the checkboxes can be easier to click than the pins. 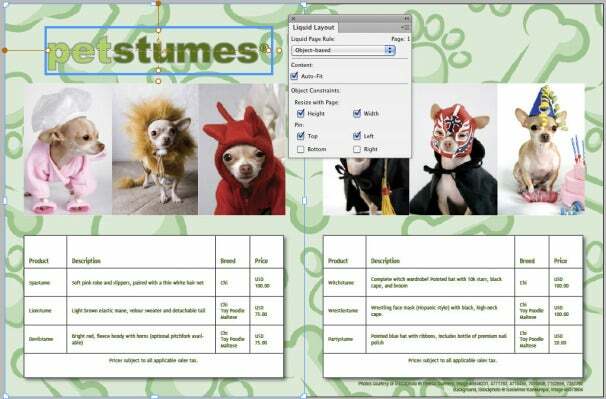 Using the object-based Liquid Layout rule, I’ve told InDesign that when the page changes size and/or orientation, the Petstumes logo should remain pinned to the top and left edges of the page. (Note the solid brown circles extending from the object to the page edges.) By either clicking on the circles or dashed lines, or using the checkboxes in the Liquid Layout panel, you can control how or if it resizes, and whether it moves in relation to the page edges. the Liquid Layout rule assigned to their Master page. The Liquid Layout approach is just a starting point—you’ll still need to adjust objects manually after the conversion. In my testing of all of the Liquid Layout rules, none of them gave me anything close to a perfect result. Thankfully, InDesign can show you a live preview of how your objects will change. Just use the improved Page tool to drag the corner of your page to its new size and watch as objects move and resize. 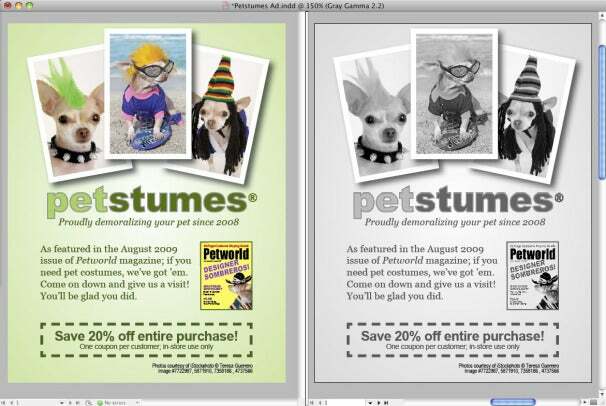 Most of the high-profile improvements to InDesign are aimed at repurposing content. The clever new Content Collector, Content Conveyor, and Content Placer tools work together to help you collect items for repurposing, multiple re-use, and efficient placement. They're a perfect fit with InDesign’s conventions of placing content and editing. For example, Adobe fashioned the Content Placer to match the behavior of the existing Placer Gun—you can place multiple objects from the Conveyor one after the other, or skip some as you’re placing them. The Content Conveyor lets you collect objects from a page, and then place them into other pages or layouts. You can choose to link to the original objects and map original text styles to new ones. These features reflect the increased popularity of creation for tablets like the iPad, Kindle, and Nook ebook readers. Adobe has improved the output quality for ePub-based readers and streamlined features for creating ePub-ready documents. For example, you can now paste or place interactive HTML content into an InDesign layout, and when you export the document to HTML, ePub 3, or .folio format, the interactivity remains. Oddly, InDesign’s installation does not include Digital Publishing tools such as Folio Builder and Folio Overlays. When you open the Folio Builder panel for the first time, it instructs you to use the Help menu to download the latest updates. Adobe has enhanced its ePub support in various ways, not the least of which is that the output is far more likely to pass ePub validators, and thus more likely appear as you intended in an ePub reader. 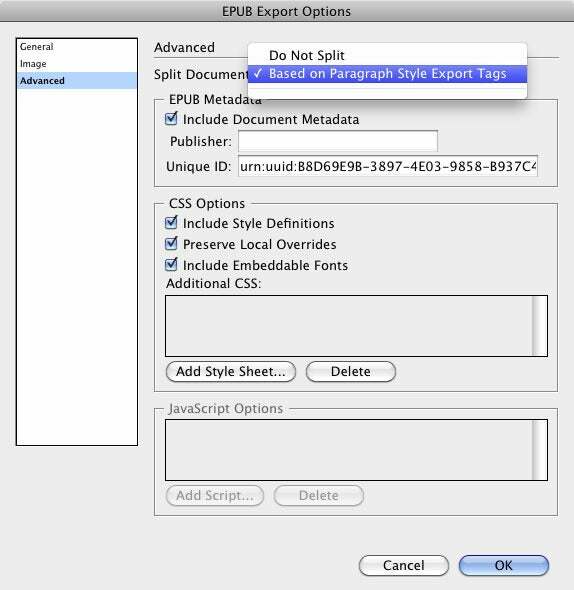 One reason is that InDesign CS6 supports the inclusion of your own CSS formatting files, which allows, for example, a reset to default settings of the reader’s device before rendering the ePub file. Previewing your final ePub file is a hit-and-miss affair, so you’ll still want to preview it on as many devices as you can. Adobe's Digital Editions previewer still isn’t (and maybe can’t be) accurate in showing what an actual ePub reader will display. On the positive side, InDesign now exports .xhtml files instead of .html for compatibility with more readers. Creating an ePub file is far easier in CS6 than it was before. For example, in the Paragraph Style options, the new Export Tagging category has a checkbox: Split Document (ePub only). When you export to ePub, you can use this feature to break pages based on paragraph style sheets (such as Section Head). This is so much easier than it was in CS5.5. The ePub Export Options dialog box has a smart redesign, with new support for custom bullets and numbers, and tables. Other ePub-authoring improvements include allowing an inline frame to maintain its background color, frame width, and inset, and graphics anchored in the text flow can now be exported with their text wrap. Oddly, with ePub 3 barely on the brink of acceptance, Adobe has chosen to include its own, proprietary ePub 3 option: ePub 3 with Layout. This format supports multiple columns, text wrap, and adapting layouts across different mobile devices. I don’t think proprietary formats have any place in an open standard such as ePub, but only time will tell. 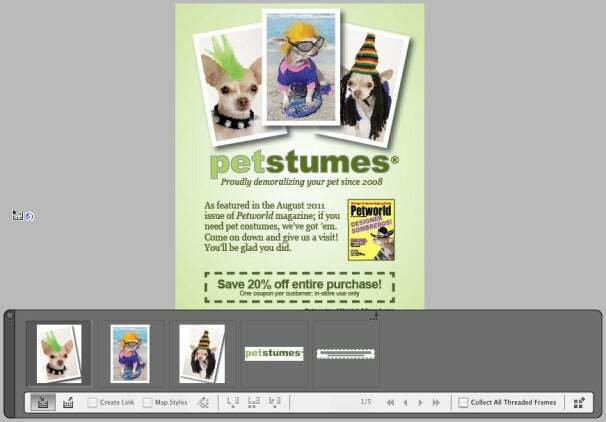 In previous versions of the Creative Suite, you had to use Adobe Acrobat to add interactive form elements to a PDF file. In InDesign CS6, you can now create most common PDF items, including a text field, radio button, checkbox, combo box (popup menu), or signature field, as well as buttons for printing, submitting a form by email, and clearing the form. InDesign includes several pre-built fully functional buttons with rollover options, or you can convert your own objects into buttons. InDesign CS6 includes a collection of pre-built, interactive PDF form buttons, checkboxes, radio buttons, and fields that you can drag and drop onto your page. You can even include tooltips, set the tab order for form fields, and show and hide form fields based on triggers such as responses to other questions on the form. However, to preview and edit PDF forms, you’ll still need Adobe Acrobat Professional. And, there are limitations: when creating fields in InDesign, fancy text frames are converted to a simple rectangle, so if you want to use a fancy text frame, you’ll need to add a simple text frame on top of it and then convert that simple text frame into a field. You can now preview your page as it might appear printed in grayscale or exported to PDF as grayscale. Here, the InDesign’s new Split Window feature lets us see two versions side-by-side. 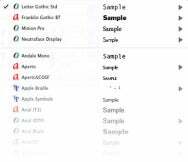 With InDesignCS6, font menus now group your most recently used fonts at the top, sorted either alphabetically or by recent use. Paragraphs that split or span columns can now have their Keep options set, to ensure that the lines and paragraphs you choose stay together. This option now works with tables, so that they don’t get split from column to column or page to page. When adding or removing text from a text frame, auto-size options now let you determine whether the text frame will get taller, wider, or both, and in which directions. It’s helpful for avoiding overset text, and is especially handy when adjusting the text inset for a frame. In addition, if you allow it to scale in both height and width, the text frame will keep its proportions as it changes size. You can even control whether lines of text are allowed to break—essentially, this controls whether the text will wrap to a new line or the text frame will widen to accommodate new text, until it reaches the edge of the pasteboard. Working with text frames is also more efficient than before. For example, a text frame containing multiple columns can now automatically add or remove columns when you resize the frame. You specify a maximum column width, and if the columns grow wider than that, InDesign creates a new column. You can also add this setting to an Object Style, to apply it to multiple text frames. 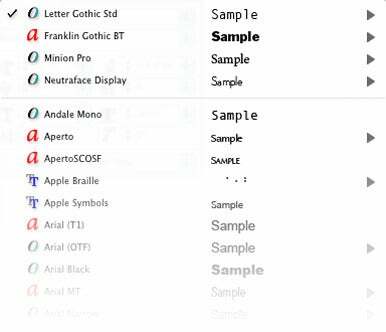 Font menus now show recently used fonts at the top, arranged either chronologically by use, or alphabetically. Open-source Hunspell dictionaries are now used by default, and you can choose any of more than 100 dictionaries to install. Also, if you’re fond of double-clicking the bottom handle of a text frame to auto-fit the text, you’ll love that Adobe has expanded this feature. Instead of working only on simple rectangular text frames, it now works on multi-column text frames, threaded text frames, and oddly-shaped text frames, even if another object is causing text wrap in the frame. When creating a new document, there is now an option for a Primary Text Frame. This allows you to choose one text frame on the Master page that you can fill with text on the document pages, without having to first override that frame. It’s incredibly helpful for setting up a long document that has text flowing from page to page, and even more helpful when changing the Master page assigned to a document page (for example, when changing page size and orientation in a digital publishing document). If you used a Primary Text Frame when you originally created the layout, the Primary Text Frame simply changes from its old shape and location to the new one. 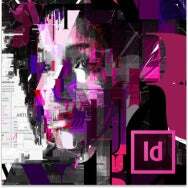 Adobe has taken over development, support, and sales of Middle Eastern versions of InDesign. New features in the Middle Eastern version include support for tables in the Story Editor, improved Kashida justification, enhanced diacritic positioning, and other text-handling improvements.